Charlotte, North Carolina’s largest city, is a great place to explore by bike. On this morning or evening tour, pedal through sprawling parks and down beautiful tree-lined streets while learning about Charlotte’s history, culture, architecture, art and entertainment from your guide. Highlights on this Charlotte bike tour include Levine Avenue of the Arts, the Mint Museum, the Bechtler Museum of Modern Art, the Gantt Center, Trade and Tryon and Fourth Ward Park. Meet your guide inside the Overstreet Mall at your selected departure time. You’ll be outfitted with a bike and helmet and given a brief safety orientation before embarking on your 1.5-hour bike tour of Charlotte. Engage all of your senses as you pedal down beautiful tree-lined streets and through parks filled with history. Pause at the intersection of Trade and Tryon streets, which mark the city's center and divides the city’s first four wards. Cruise down Levine Avenue of the Arts past local shops, coffee shops and restaurants cooking up classic Southern food. This avenue is home to the Levine Center for the Arts, one of Charlotte’s key cultural destinations comprised of the Bechtler Museum of Modern Art, the Harvey B Gantt Center for African-American Arts and Culture, the John S and James L Knight Theater and the Mint Museum Uptown. Pedal past The Green, small public park, and explore historic Fourth Ward Park, located at the center of the Fourth Ward section of Uptown. This lovely green park, a common ground for all kinds of city-dwellers, features several walking trails and fountains and is surrounded by towering urban buildings. Throughout your easy, mostly flat bike ride, your guide will stop to provide commentary about Charlotte’s history, architecture, art and entertainment, and give you time to take some photos and soak up the atmosphere. 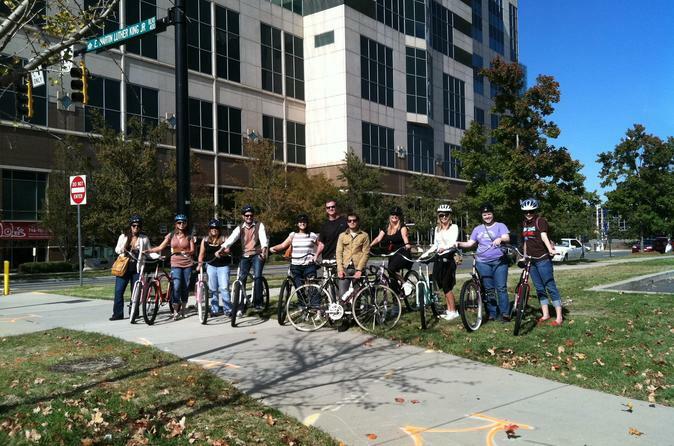 Your Charlotte bike tour ends back at the Overstreet Mall.